These Candy Cane Chocolate Cupcakes are the perfect Christmas cupcake. Super moist chocolate cupcakes are topped with peppermint frosting and sprinkled with candy canes. This Christmas I wanted to make festive cupcakes. I’ve seen so many Christmas cupcakes with pretty fondant Santas and snowman. But I’m not very experienced with fancy decorating techniques – and if truth be told – I definitely prefer the taste of buttercream to fondant. Enter: Candy Cane Chocolate Cupcakes. Super moist chocolate cupcakes, topped with peppermint buttercream frosting and sprinkled with crushed candy canes. 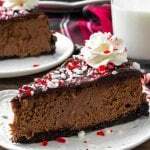 They taste like chocolate cupcake happiness in Christmas form – and are perfect for Christmas concerts, holiday parties, or an energy boost for late night present wrapping. Now, I realize most people focus their holiday baking on Christmas cookies, candies and fudge… but I don’t think you’ll get complaints by adding peppermint cupcakes in the mix. These start with the chocolate cupcake recipe from my favorite Ultimate Double Chocolate Cupcakes. It uses oil, buttermilk and sour cream for ridiculously moist and soft cupcakes. Then dutch process creates a deeper chocolate taste. If you don’t have dutch process cocoa, natural unsweetened works too. Then for the peppermint frosting… It’s fluffy, piled high, super smooth, and taste like candy canes in frosting form. 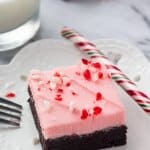 The peppermint flavor comes from peppermint extract, then a few drops of red food coloring make for the pretty pink color. It reminds me of candy cane blizzards from Dairy Queen but without the brain freeze. As you can tell by the photos – I use a pretty healthy dose of peppermint frosting on my candy cane chocolate cupcakes. But you can also frost your cupcakes using a flat-edge knife instead if you’re less of a frosting addict. The combination of moist, super soft chocolate cupcake crumb and fluffy, creamy peppermint frosting is so delicious. And if you’re looking for a holiday recipe that’s a little extra special – these Candy Cane Chocolate Cupcakes are the perfect thing! Preheat the oven to 365F degrees. Line 2 regular sized muffin tins with muffin papers. You'll end up with about 18 cupcakes total. In a large bowl whisk together the flour, cocoa, cornstarch, baking soda, baking powder and salt until evenly combined (about 20 seconds). Then in a separate large bowl using a stand or hand held electric mixer, beat together the oil and sugars until no lumps remain. Add in the eggs and vanilla and continue beating for about 1 minute until well combined. In a small bowl or liquid measuring cup, stir together the sour cream and buttermilk. Carefully beat about 1/2 of the sour cream & milk mixture into your oil & sugar mixture with the mixer on low speed. Then beat in the flour mixture, followed by the rest of the milk & sour cream. Beat until no lumps remain, but be careful not to overmix your batter. Carefully spoon the batter into your prepared muffin tins, filling each muffin cavity about 1/2 to 2/3 full. Be careful not to fill your cupcakes too full. I like to use a large cookie scoop to make this easier. Bake for 15-17 minutes or until an inserted toothpick comes out clean. Allow the cupcakes to cool in their pan for 10 minutes then continue cooling on a wire rack. While the cupcakes are cooling, make the peppermint frosting. In a large bowl using a stand or hand-held electric mixer beat the butter until well softened. Add in the powdered sugar about 1 cup at a time until you've added in 3 cups total. Then slowly add in the whipping cream about 1 tablespoon at a time while continuing to beat the mixture. Add in more icing sugar 1/2 cup at a time until you reach the desired sweetness level and consistency. Finally, beat in the peppermint extract and red food coloring, one drop at a time.